In 1965 and with just one store, PEP started to sell affordable, good quality merchandise. Over 40 years later, PEP is the largest single brand retailer in Southern Africa. Altogether, PEP has 1 500 stores and employs 15 000 people. PEP is also the biggest seller of airtime in South Africa and was the first retailer in the world to sell airtime through its tills. PEP is often a lifeline in rural and remote areas where it sells essential items - there's a PEP in almost every town and village in South Africa. PEP also owns and runs the largest clothing factory in Southern Africa. 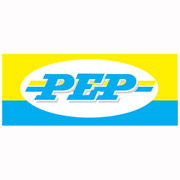 Pepclo (PEP Clothing), which manufactures much of the clothing and most of the school wear that PE sells.